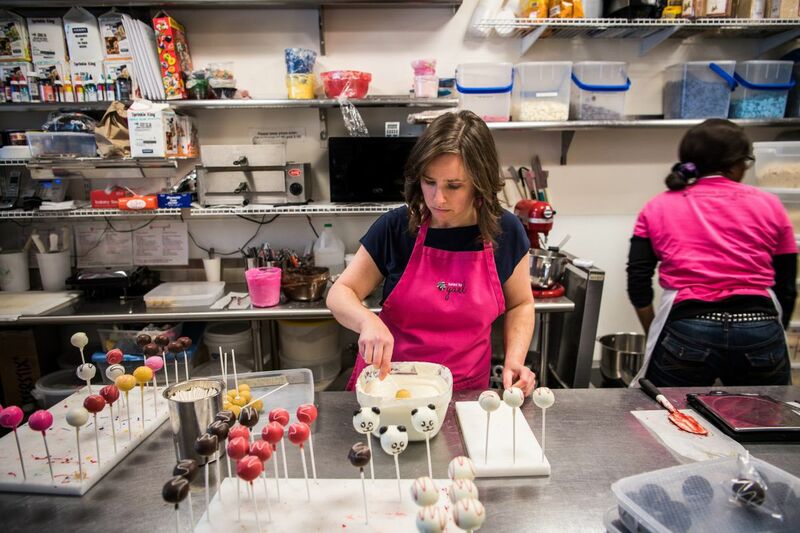 Owner Yael Krigman dips cake pops at her shop Baked by Yael in Washington. Yael Krigman was sitting on the classic American success story just a couple of years ago: Ivy League degree. Six-figure income at a top law firm. Fluent in Spanish. Classical musician. And a Fulbright scholar, to boot. "I wanted to own my own business," she said, simply. "When I was a law firm associate, I pulled all-nighters for the firm's clients. I reviewed profit-and-loss statements for other companies. Now, when I pull an all-nighter, it's for my own clients." Although cake pops might sound like a fanciful reason to quit your job, her willingness to walk away from the security of a blossoming law practice and put everything on the line is the stuff that separates entrepreneurs from the rest of us wage slaves: A desire to create something and to control your own destiny. She knows the pressure of having her own business. Krigman owns a hefty bank loan, a payroll of 30 employees, and a painful monthly lease for her storefront across from the National Zoo. Like most small-business people getting started, Krigman works every day. Baked by Yael has stands at four weekend farmers markets in the District of Columbia and Alexandria, Va. She also sells at a synagogue Sundays. I interviewed her on the phone this month while she and her boyfriend were barreling down the New Jersey Turnpike in a van piled with 1,000 cases of gluten-free oat matzos fetched from a Brooklyn source. She pulled into her Washington condo at 2 a.m. Baked by Yael is a family business. Krigman is the sole owner, but she has recruited Mom (helps with online orders), Dad (company handyman), and even the boyfriend (a front-counter person and the Baked by Yael social-media ambassador). Krigman has a cheerful demeanor, but her no-nonsense conversation is sprinkled with phrases such as "scientific approach," offering me a clue to her intensity. She is especially proud of a mission that serves hard-to-reach customers in search of vegan, gluten-free, nut-free or kosher products. "I am filling a very important void in the city," she said. Although she loves the baking part, Krigman is not sentimental. "I have staff, banks and vendors who all need to get paid. I have to focus on the fastest path to cash and, at the moment, that's with corporate catering, cake pop parties and online gift orders." Ergo, her motto: "What is the fastest path to cash?" Baked by Yael will gross more than $600,000 this year selling everything from bagels to fancy gelato to breakfast sandwiches. Just under half of that gross revenue comes from the average of 300 or so cake pops (at $2.95 each) that sail out of the store each day, whether it's to a nearby resident needing a sugar fix or a delivery to one of the office parties, birthdays, bar mitzvahs, or dozens of hotels she sells to in the area. Although Baked by Yael is a retail bakery, the real cash is in catering. The issue then is whether the rent that comes with being in a prime retail location is worth the money. Wouldn't it be more efficient to give up the retail, concentrate on catering, and bake at a less-expensive location? "To be honest, the rent for my prime location may not be worth the walk-in traffic," she said. "The rent is overwhelming. Unfortunately, I have to pay off my construction cost before I can consider a less expensive location." The visibility helps. Even before the doors opened three years ago, a passerby saw Baked by Yael signs and ordered $8,000 worth of cake pops. The walk-in customers were about 40 percent of sales last year, she said. Those walk-ins have value other than monetary: Serving them keeps her motivated. "Placing the operation in a retail storefront lets me add the walk-in business and actually see the smiles on the faces of my customers," she said. "And every person who comes into the store is an opportunity. That said, catering is where the money is." Krigman said she needs word-of-mouth and simple marketing to bring in a few thousand more a month to put her in the black. She worries that the zoo tourists and foot traffic don't see her storefront because of the competition from recognizable brands a few doors away: Starbucks and 7-Eleven. "Our biggest challenge is getting people to walk past the big chains they're so familiar with and walk into our store," she said. She has no money for a marketing budget, so her solutions include sending employees across the street to hand out Baked by Yael postcards to zoo visitors, holding kiddie cake pop parties (at $295 for eight) on Saturday mornings, and touting her fresh, hot bagels to anyone who will listen. "On weekend mornings, almost all of our customers come in for bagels and bagel sandwiches. But then they see the cake pops," she said. "Even if they don't buy one, we've gotten them in the door and have an opportunity to plant the cake pop seed for the next time." Krigman has been noshing on bagels since she grew up in Annapolis, Md., where her mother taught violin and her father was a computer engineer. She graduated from the University of Pennsylvania in 2002 and spent a year in Spain studying nonprofit management on a Fulbright fellowship. She got a job at the D.C. office of White & Case, an international law firm based in New York. She started experimenting with baking her own bagels about 2008. "It came out delicious," she said. She expanded her oeuvre to rugelach, raspberry bars, and black-and-whites (we call them half-moons). One popular item was the cake pop, a newfangled dessert on a stick that was the hit of the law office. Her colleagues at White & Case suggested she start a baking business. In 2010, while still at the firm, she used her legal smarts and contacts to get the paperwork for Baked by Yael off the ground, including a tax ID and a business license. She started to build a customer base, one person at a time. She created a Baked by Yael online store to list her menu offerings, using an e-commerce platform. She set up PayPal and credit card processing accounts. She found a wine store that would hold the cake pops for customers to pick up. She tested her baked goods at an Annapolis mall, where she rented a kiosk for five months in 2011. "It didn't work," she said. "But I learned a lot of valuable lessons that helped me define my target market." She zeroed in on law firms because she knew their needs and that they could afford the cake pops. "After eight years at a law firm, I know when recruiting season is, I know when firms are welcoming summer associates, when they're hosting receptions for prospective associates," she said. "I know that the receptionist is my best friend when it comes to securing catering orders." "The more I started to sell them, I realized how versatile and customizable they are, and how many different ways I could sell them to every industry and age group," Krigman said. "They can be branded. You can hold a cake pop in one hand and a glass of wine in another. You can advertise, put company logos, school mascots on them. " Baked by Yael started getting some notice: Online reviews, Washingtonian magazine, CNN, Voice of America. She raised nearly $75,000 on a month-long Kickstarter campaign. One giant order for last year's inauguration ball sold 6,000 cake pops. She had enough critical mass by January 2015 to launch a retail location, signing a 10-year lease in a former dry cleaning shop. She got a loan from Revere Bank, with some financing help from a D.C. program that helps fund small businesses. She doesn't miss that fancy 2,000-billable-hours-a-year law job. "If you had asked me 10 years ago if I would own a bakery, I'd have told you you're crazy," she said. "Baked by Yael is my first business and may end up being my only business. I'm not doing this because I want to run a company. I'm doing it because I want to run Baked by Yael."